English melodic rock band, made up of a couple of ex NWOBHM band Trespass,members. (Sutcliffe brothers, Crawte). This album is well played melodic rock, with a nice use of keys, in a kind of rawer After Hours vein. 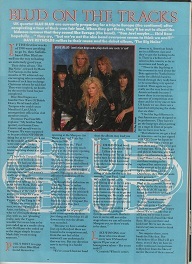 The band did release a tougher follow up album, entitled “Universal Language”, albeit under a slightly different name spelling of “Blue Blood”.